Today was grey and cloudy, not an ideal day for shooting wide-angle outside. Some character there! Splendid door/doorway, and thoughtfully composed. The wall is marginally overexposed to my eyes. Lovely door, I'd prefer more texture in the white surrounds though to stop it from inducing vertigo symptoms, not that i have the best monitor! Weathered and beaten down, did you see a wolf and 3 pigs nearby? The composition is really nice, and I like the tones. Sometimes gray days make for wonderful pictures! Like you've got a big softbox that follows you around. 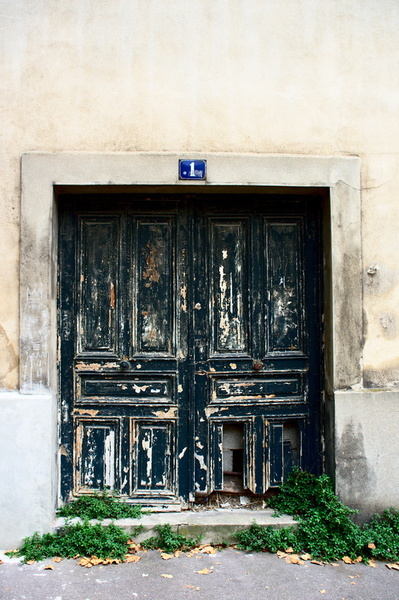 Fabulous old doors! Nicely presented.